Analyze the Evian Conference in 1938, and assess the positions of the various representatives. Your superior instructs you to prepare a paper on the Evian Conference, considering whether there are really references to contemporary situations. Underline those aspects with your own expertise and arguments, which could provide food for thought for today's situations. Adler-Rudel, Salomon, The Evian Conference on the Refugee Question, in: Leo Baeck Institut Yearbook (1968), pp. 235–276. Baynes, N.H. (Ed. ), The Speeches of Adolf Hitler, I, London, 1942, pp. 737-741. • Interview with Hannah Fischer, conducted by Tanja Eckstein, Vienna, August 2004, online: http://www.centropa.org/de/biography/hannah-fischer [retrieved 23.12.2015]. • Interview with Paul (née Hochbaum), conducted by Tanja Eckstein, Vienna, July 2002, online: http://www.centropa.org/de/biography/paul-back [retrieved 23.12.2015]. Dokumentationszentrum Österreichischer Widerstand [Documentation Centre of Austrian Resistance], Reichsgesetzblatt l. 1931 I, pp. 699-745. Encyclopedia of the United States Holocaust Memorial Museum: The Evian Conference online: http://www.ushmm.org/outreach/en/article.php?ModuleId=10007698 [retrieved 23.12.2015]. Encyclopedia of America’s Response to the Holocaust. The David S. Weyman Institute for Holocaust Studies, online: http://enc.wymaninstitute.org/?p=190 [retrieved 23.12.2015]. Drecoll, Axel, Der Fiskus als Verfolger. Die steuerliche Diskriminierung der Juden in Bayern 1933–1941/42. München 2009. Foulkes, Imogen, Global refugee figures highest since WW2, UN says, 20 June 2014, BBC News, online: http://www.bbc.com/news/world-27921938 [retrieved 23.12.2015]. German Foreign Ministry Memorandum on Policy Regarding Jews in 1938, Berlin, 25 January 1939, in: Documents on German Foreign Policy 1918-1945", series D (1937–1945), Vol. V, Baden-Baden, 1953, pp. 780-785. Gilbert, Martin, The Dent Atlas of the Holocaust. Handbook on Procedures and Criteria for Determining Refugee Status under the 1951 Convention and the 1967 Protocol Relating to the Status of Refugees, Geneva 2011, online: http://www.unhcr.org/cgi-bin/texis/vtx/home/opendocPDFViewer.html?docid=3d58e13b4&query=1951%20Geneva%20convention [retrieved 23.12.2015]. Laffer, Dennis Ross, The Jewish Trail of Tears The Evian Conference of July 1938 (2011). Graduate Theses and Dissertations. Online-Publication: http://scholarcommons.usf.edu/etd/3195 [retrieved 23.12.2015]. Lauterbach, Leo, The Situation of the Jews in Austria, April, 1938,” London Zionist Archives, S5/653, printed in: Yitzhak Arad, Yisrael Gutman, Abraham Margaliot: Documents on the Holocaust. Selected Sources on the Destruction of the Jews of Germany and Austria, Poland, and the Soviet Union, Yad Vashem Publications 1999, pp. 91-93. Levin, Nora, The Holocaust: The Destruction of European Jewry, 1933-1945 (NY: The Schocken Books, 1973), p. 70. Meir, Golda, My Life, New York, 1975, p. 158. Mondale, Walter, Evian and Geneva, in: New York Times, 28 July 1979. These sentences were part of a speech on the question of boat people at the United Nations Conference on Indochinese Refugees, 21 July 1979. O’Hare McCormick, Anne, Europe; The Refugee Question as a Test of Civilization, in: New York Times, 4 July 1938. Proceedings of the Intergovernmental Committee, Evian, July 6th to 15th, 1938. Verbatim Record of the Plenatary Meetings of the Committee.Resolutions and Reports. London, July 1938. Schwarz, Jochen: Von Evian nach Brüssel – Eine Konferenz zum Flüchtlingsschutz und die Realität an den Außengrenzen der EU, online (German): http://www.borderline-europe.de/downloads/Von_Evian_nach_Bruessel_0708.pdf [retrieved 23.12.2015]. Das schwarze Korps [The black corps; magazine of the SS troops], 24 November 1938. Article: Juden, was nun? [“Jews, what next?”]. Microfilm, House of the Wannsee Conference, Memorial and Educational Site. Strauss, Herbert A., "Jewish Emigration from Germany: Nazi Politics and Jewish Responses (1)," Leo Baeck Institute Yearbook 25 (1980): 313-361, here Tab. VII, 326. Voelkischer Beobachter, North German edition, 13 July 1938, Article: Keiner will sie haben [„Nobody wants them“]. Microfilm, House of the Wannsee Conference, Memorial and Educational Site. English translation: http://www.jewishvirtuallibrary.org/jsource/Holocaust/evian2.html; Internet [retrieved 23.12.2015]. UNHRC: Global Appeal 2015 Update – Europe summary, online: http://www.unhcr.org/5461e5f80.html [retrieved 23.12.2015]. UNHRC: Statistics – The World in Numbers, interactive map, online: http://popstats.unhcr.org/en/overview [retrieved 23.12.2015]. UNHRC: Europe’s Refugee Emergency Response. Update #14, 4 – 10 December 2015, online: http://data.unhcr.org/mediterranean/download.php?id=282 [retrieved 23.12.2015]. The aim of the material provided here is to inform about the international conference of Evian in 1938, in view of discussing the current refugee issue and its challenges for governments. The historical experience of the Evian conference sheds a light on the difficulties in finding an adequate and humane response to the refugees’ situation Europe finds itself confronted with. Between 1933 and 1937 alone, at least 135 anti-Jewish laws and ordinances were enacted by the Nazi Regime, banning Jews from professions, institutions, from one branch of economic life after the other and depriving them of many of their rights as German citizens. By the end of 1937, about 130,000 German Jews, one in four, had already left. After Nazi-Germany annexed Austria in March 1938, an additional 190,000 Jews were subjected to Nazi rule. The pogroms following the "Anschluss" caused a new wave of Jewish emigration. In the countries bordering on "Greater Germany" many refugees tried to eke out a pitiful existence, legally insecure and economically dependent on the aid of various mostly Jewish relief committees. Emigration from Germany and annexed Austria or in spring 1939 the former Czech Reichsprotectorate of Bohemia and Moravia meant giving up all personal property and any assets to the Nazi State and to the profiteers of "aryanization" and leaving everything behind except for a small amount of almost worthless 100 Reichsmark (later only 10) and a suitcase in the hand. Getting further away from Germany under the threat of an upcoming war required the purchase of an expensive passage by ship and in most cases a so-called affidavit (a document proving that somebody abroad would warrant financing all needs of the refugee), not to mention numerous other documents. "Although the Nazi terror against Jews provoked public protests throughout Europe and America, it was mostly still considered by other governments as an internal affair which was not to be interfered with as long as the Germans were not trying to attack directly the interests of foreign states." (Adler-Rudel, 1968, p. 235). The Evian Conference was convened at the initiative of US-President Franklin D. Roosevelt in July 1938 to respond to the increasing numbers of Jewish refugees in Europe fleeing persecution by the Nazis. In his announcement Roosevelt mentioned, that "no nation would be expected or asked to receive a greater number of emigrants than is permitted by its existing legislation", but certainly he hoped to obtain commitments from some of the invitee nations to accept more refugees. 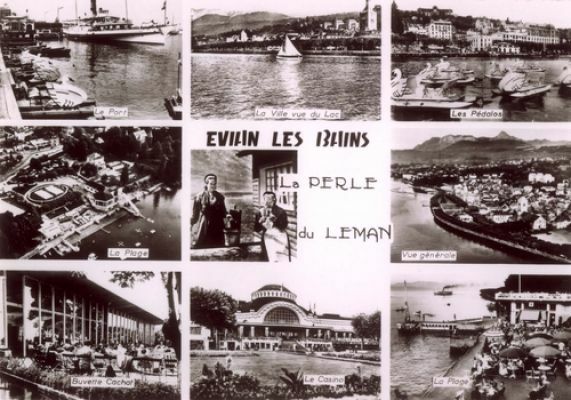 The conference of Evian on Lake Geneva resulted in almost no change in the immigration policies in most of the attending nations but lead to the creation of the Intergovernmental Committee on Refugees (ICR), charged with approaching "the governments of the countries of refuge with a view to developing opportunities for permanent settlement" and seeking to persuade Germany to cooperate in establishing "conditions for orderly emigration." The ICR received virtually no funding or other support from its member nations. Its achievements were minimal until September 1939; then the beginning of World War II ended all its efforts. Commenting on the Evian Conference, the German government made use of the opportunity to state how "astounding" it was that foreign countries criticized Germany for its treatment of the Jews, yet none of them would be willing to "open their own doors". 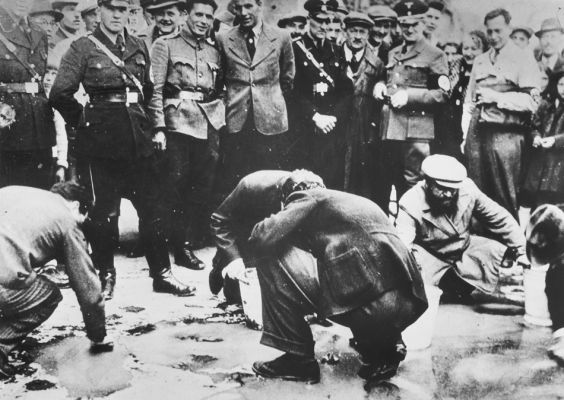 Although the violent pogroms of November 1938 ("Night of Broken Glass") were widely covered in the international press outside Germany, the United States and other countries remained reluctant to welcome more Jewish refugees and restrictions remained in place. In the early 20th century, efforts to help refugees also gained a global dimension: 1. Fridtjof Nansen was appointed in 1921 as the first High Commissioner for refugees of the League of Nations, the forerunner of the United Nations. 2. After WW II the United Nations Relief and Rehabilitation Agency (UNRRA) assisted seven million people "displaced" during and after the Second World War, and 3. The International Refugee Organization (IRO), created in 1946, resettled more than one million displaced Europeans around the world and helped 73,000 civilians to return to their former homes. None of these early refugee organizations were sufficiently strong, legal protection remained rudimentary. The United Nations High Commissioner for Refugees (UNHCR) was created in 1950 and the following year 26 participating countries adopted the Convention relating to the Status of Refugees, also known as the 1951 Geneva Refugee Convention.